Ok...Here we go! 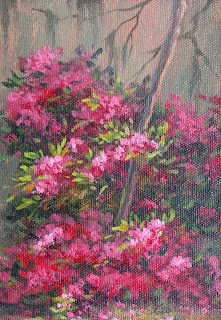 This is the first painting offered in my new weekly auction of miniature oil paintings. It was inspired by a trip to Ft. Pierce on the East Coast of Florida. 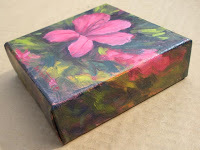 The painting measures 5"x 7" on canvas panel. Each of these paintings will be fresh, right off the easel. I plan a variety of subjects such as landscapes (of course), sky scapes, and birds. And the sizes will vary from 5" x 7" to very tiny 2" x 3" that you have seen here in my other auction. Just email me with your bid. I will post the highest current bid here so check back often. Remember, a new painting will be offered each Monday. Bidding starts as soon as the painting is posted and ends the following Sunday at 5 PM EST. And the bids start at just 99 Cents!! Wow! The time has really flown by since my last post and lots has happened: The group show with my fellow members of Out of Hand Artist Salon was a success. It was beautifully hung by Dr. Leslie Hammond and was the hit of the season. 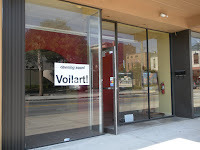 ; the Inaugural Exhibit for the Florida Museum for Women Artists in Deland, Fl. opened and was outstanding! I am proud to have my work included in such an historical event. ; "Marvelous Minis for Merry Making" Exhibit and Sale at Voilart! Art Gallery attracted a lot of attention during the holidays. ; and best of all, I got a brand new grandson!!!! The miniature show was so well received I have decided to start the new year with a new auction. A miniature painting 5" x 7" or smaller will be posted each Monday with 5 pm Eastern time Sunday night being the final auction-bid deadline. And each auction will begin at just 99 Cents. Tomorrow is Monday...so check back to see the new miniature painting being offered. Remember you only have 7 days to bid. Our "Gala Reception" has come and gone. The seven of us cleaned up pretty darn good. From left to right: Sharon Crute, Margaret Watts, Lorna Effler, Nancy Moskovitz, me, Moe Hahn and Mary Verrandeaux. We had a nice turn out, especially for our first group show. And better yet, a few paintings were sold. The show will be up until November 14, so there is still a chance for you to stop by the Brick and take a look. My husband, Harry, was a big hit when he walked in with his top hat on to act as bar tender, along with Nancy's husband Rick Moskovitz. It was a fun evening. The work looks great. New contacts were made. All in all---I count this show a success!! There is a great deal of satisfaction that comes when you put a show to bed after you have done all you can do to pull it together. "OoHA H.U.G.S. Ocala" will be either a great success or a big failure, but I am at peace with the fact that our salon did as much as we could to make it successful. The Gala Reception is tonight, Friday Nov. 6, so at 5:30 all seven of us will be in position, ready to greet all those who come to support us and H.U.G.S. Charities, Inc. We are giving a lot away on this one...25% of sales to H.U.G.S., a non-profit organization that raises funds for the research, prevention, detection and treatment of all forms of cancer and assists individuals and families whose lives have been affected by it and 25% to Marion Cultural Alliance to further the arts in Marion County. If you are in the area tonight for the reception or anytime before the show closes November 14 come by the Brick to be treated to some of the best art found in the area. I am confident you will walk away with a new appreciation for the quality of art and artists that are right here in Ocala. The Sneak Preview Party Friday night at Voilart! Art Gallery was great fun. Many people who could not attend the Ocala Art Festival Saturday or Sunday enjoyed seeing the new paintings in the relaxed atmosphere. No parking problems and no heat was certainly a plus. While I was preparing for the party Friday, my husband set my tent up at the art festival. Then after the party we packed up all the paintings and headed for the show grounds with them. Very early Saturday morning we hung the art and got ready for the crowd that always turns out for this outstanding event. Yep, this is me with the Cheshire Cat Grin. All in all it was an exciting...and exhausting weekend. Now comes the task of putting the gallery back together and getting the paintings ready for the next show. Voilart! 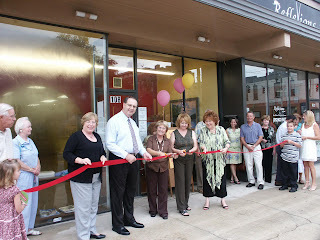 Art Gallery and Working Studio opened with great fan fare at our gala Ribbon Cutting Ceremoney September 4. Many collectors, family and friends attended including County Commissioner Barbara Fitos, County Administrator Lee Niblock, Marion Cultural Alliance Director Nancy Ledding and Dr. Lofgren, Director of the Appleton Museum of Art. Our first month has been successful. Many clients have dropped by to see the gallery and take home paintings for their personal collections. People visiting downtown discover us and walk in, delighted to find top quality art with the added bonus of visiting with us (the artists) and watching us paint. All in all, my partner Sharon Crute and I have had a wonderful month and are looking foreward to the future. Thanks to all who have supported us in the venture!! Wednesday through Saturday 11a.m. - 6 p.m. The is how the studio space looked while we were working on it. We did not have a great deal to do, thank goodness. Sharon and I had butterflies as we put final touches on the gallery. Hanging the paintings was a lot of fun. It is great to see your work exhibited in a beautiful space with perfect lighting. Leslie was out with pal and birthday girl Teri Carey. 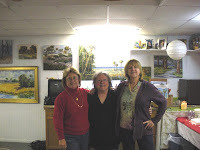 My very good friend and wonderful artist Susan Cassens made the long 3 hour drive from Ft. Pierce to surprise me. She and I had a similar studio/gallery almost 20 years ago. The preview opening was a success. Many friends, relatives, collectors and people enjoying "Ladies Night Out" came in to welcome the new kids on the block. We got our CO --- Certificate of Occupancy---yesterday! Now we just need to get the electricity turned on. The walls are patched and painted. The new trac-lights are installed. The floor is mopped. The huge plateglass windows have been cleaned. Next comes the art work!! We are on track for our soft opening, which is a preview with not much fanfare, scheduled for Thursday, August 20. Ocala sponsors a "Girls Night Out" each month, with stores staying open later in the evening for extended shopping and dinning. This will give us an opportunity to introduce ourselves to the public in a relaxed atmosphere before our Gala Opening in September. The studio/gallery is beginning to come together. The wall color is bold and striking with everyone who enters commenting on it. So, Sharon and I have decided to keep it...which means less work for us. We can always paint over it in the future if we want to. The space was previously used as a dance studio and had a full wall of mirrors. We donated the mirrors to a wonderful new Performing Arts Center for young people in downtown Ocala. They removed the mirrors and are patching the wall. The current ceiling lights are certainly adequate, but art needs really good lighting. After searching Ocala (I always try to buy locally) for track lights nothing met our needs. So, off to IKEA in Orlando where we found the perfect lights...and on sale!! Next week the patched wall will be painted, lights will be installed (thanks to our husbands) and then...drum roll please....we get to hang our paintings!!! Good friend and great artist Sharon Crute and I are opening a studio/gallery for our own work. We both are extremely excited and looking forward to this adventure. The shop is in a prime spot in historic Ocala just off "the square" where everything happens. 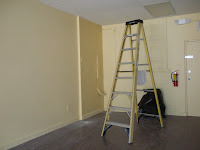 There isn't much to do to the space but, we will be working the month of August painting the walls, installing track lighting, hanging our art work and setting up our painting areas. Thank goodness both Sharon and I have wonderful husbands who have volunteered to help with the labor. Our target date to open to the public is September 1. Not only can you see, and purchase, our finished paintings but you can watch as we create new ones. I will keep you updated as we progress. Wow, my show season is just about to begin. I have several outdoor festivals and plein air events penciled in with some of those confirmed. Take a look at Show Schedule in the left column and down a bit for exact dates and places. 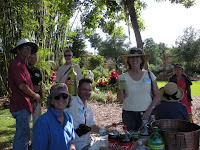 I am very excited about the first event on my schedule ... a new plein air paint out October 6 - 10, 2009. 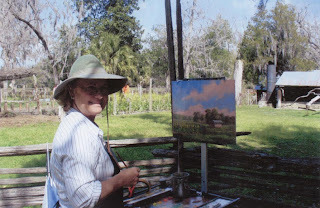 Painting the Region: The Bartram Trail is a five-day juried painting event to support North Florida Land Trust, Inc's preservation efforts and to help promote the St. Johns Cultural Council's Northwest Arts Advisory Group in St. Johns County. 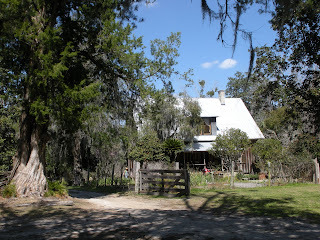 Four exceptionally scenic, historically significant locations along the Bartram Scenic Highway will be showcased: Alpine Groves and Marywood on the St. Johns River, the cypress-lined lake at Stetson Kennedy's home at Beluthahatchee, and the Bailey Family's working horse and cattle ranch with adjacent waterfront vistas. The public is invited to watch the artists painting and participate in free daytime activities and ticketed evening receptions. Events include a St. Johns Chamber meet-and-greet reception, cocktails and appetizers at sunset on the St. Johns River, and on Saturday, a family day with educational activities for children and parents, food and great music. Saturday, October 10, the North Florida Land Trust will also celebrate its 10th anniversary at Alpine Groves County Park. Paintings created during the event will be for sale right off the easel, in the wet room or at any of the activities and receptions. A portion of the sales will go to the Land Trust and St. Johns Cultural Council. Mark your calendars....this is shaping up to be one of the outstanding plein air events this season!! Yep, I have finally returned home. The trip was great. We saw Bette Midler and the Osmond Shows in Las Vegas, camped in the Rockies, went underground in Mammouth Cave and drove past miles and miles and miles of corn in Iowa and Nebraska. I am busy getting my house back in order and spending time with the grandchildren. My studio gets my undivided attention next. I am itching to get to the easel. I have paintings rolling around in my head that are anxious to get onto the cavas. As soon as I have new paintings to show I will post a couple here. I will also be posting a new miniature painting soon. So, check back now and then. The last few months I have been on the go with shows and plein air events. So, I have decided to take some time off. When I return to the studio I will share my adventures with you. I think we all go at such a frenzied pace we need to drop back now and then and "smell the roses". How about it you all? If you can't actually get away to another place why not just take a day for yourself or maybe just an hour or two to get recharged? Join me for some well deserved R and R.
Elin Pendleton is a ball of energy. She hits the ground running the very first day of the workshop or Boot Camp as she calls it. And we quickly learned why she uses that term. She has a lot of information to give in just 5 short days. She encourages FUN but keeps everyone on task and working. Her Color Boot Camp centers on warm and cool colors---where to put them (in light or shadow) and at what time of day or under what atmospheric conditions (mist, early morning, afternoon, evening, night, backlight). Since I have painted the landscape for years I thought I had this pretty well figured out. I soon learned ----there is much more to learn! Needless to say, I am sold on her approach to handling color. I returned home from the Winter Park Paint Out with just enough time to unpack and then repack all my painting gear for the Elin Pendleton Color Boot Camp in Wiersdale, Fl. The days have been packed with information...lectures and demos by Elin and each of us creating paintings under her direction. My mind is realing from it all and we have two more days to go! I will post photos after the workshop. Now I am off again! Wow! What a great week. 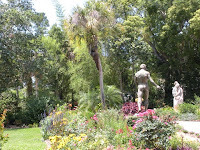 The Winter Park Paint Out held at the Albin Polasek Museum & Sculpture Gardens was top notch. 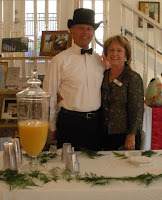 The artists every need was anticipated by the show committee---continental breakfast each morning at the museum, snacks and water throughout the day, a wonderful heavy hors'oeuvre reception, pot-luck-dinner and Gala Opening Reception. Hal Stringer and his committee deserve a well earned THANK YOU. Their hard work was rewarded with good attendance and sales. And of course, happy painters. I moved to and lived for almost 20 years in Ft. Pierce on the east coast of Florida. My children grew up there and still consider it their home town. Though I did not know it at the time, that move would change my life forever. 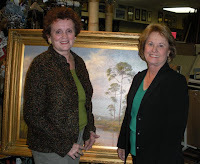 Nationally recognized Florida landscape painter, A.E. "Bean" Backus was a native son of Ft. Pierce. He became my mentor, teacher and personal friend. Because of Beanie I developed into a professional painter with a busy career. Although I moved from there many years ago I still return to support the local arts community as often as possible, as hommage to Beanie. So, today I am trekking back to participate in the Second Annual "Souvenirs of Downtown" Invitational En Plein Air Event. Sponsored by Main Street Fort Pierce, Inc. it is held in Historic Downtown Fort Pierce April 22-24. Paintings produced during the paint out will be for sale, wet, right off the easel or may be purchased at the two FREE- OPEN TO THE PUBLIC RECEPTIONS---Thursday April 23 and Friday April 24, 5-8PM at the Platts/Backus House (122 A.E. Backus Avenue). A portion of the sales goes to Main Street Fort Pierce, Inc and the renovation of the Platts/Backus House. This is a Historic Building originally owned by the doctor who delivered Bean in 1907. It later became Bean's home and studio and is where I worked with him for almost 10 years. I sincerely hope you can attend...watch artists at work....and take home a "Souvenir". Mention this Blog Post and I will give you a little "Thank You" Gift for supporting the arts. For those of you who may not know this, Ocala, Florida in Marion County is known as horse country. Beautiful horse farms with rolling hills and sprawling oak trees provide the perfect place for all types of horses from high spirited race horses to prancing Paso Finos. This past week, April 16-19, the "Festival of the Horse" was held at the Florida Horse Park in Ocala. Spectators came out to watch Dressage, Cross Country Jumping, Show Jumping, Polo Matches, and Mounted Archery Demonstrations. The Marion County Cultural Alliance rounded up some of us artists to display our paintings during the Festival. (Rounded up is horse speak for invited) They rented and set up a huge tent, dividing the space to accomodate 12 artists. Everyone was a horse painter except me. 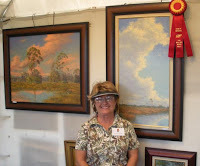 My Florida landscape paintings were well received...I even had sales. But, the stars of the exhibit were three of the best equine and animal artists in the state, if not the nation. 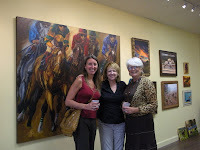 Sharon Crute's powerful oil paintings of thundering race horses gathered crowds (http://www.sharoncrute.com/), Moe Hahn's paintings of the refined dressage and carriage horses captured the attention of everyone that passed by and Mary Verrandeaux's wonderful portraits of horses and dogs inspired oohhsss and aahhss (http://www.mverrandeaux.com/). I am not what anyone would ever call a horse person but the event was fun. I was in the company of great artists and met wonderful people from all over the nation. Life doesn't get much better than that. Two accomplished artists and good friends Sharon Crute and Nancy Moskovitz have spoken often about Elin Pendleton and her "Color System". So, in the interest of knowledge, I dove into the digital world and came up in Elin's web site (www.elinart.com). Artists are continually on the quest for how to do it better. I, for one, am always challenged by color, among other things. Elin Pendleton has developed an interesting, understandable way to handle color that is logical and seems effortless. Yes, I splurged and ordered Elin's "Flash Card Color System". Then decided I had to have her DVD on Plein Air Painting. Why stop there? The credit card came out and with a flick of my finger her other 3 DVDs were on their way to my house. I watched all the DVDs and read the Flash Cards. Then off to the drug store. Why the drug store? you ask. To buy the pill boxes of course. All humor aside, I highly recommend any of Elin's DVDs or Flash Cards. The information is presented in an understandable, straightforward way. She talks as if you are right there in front of her...not a camera. She explains cool colors and warm colors, where to put them at what time of day. I don't know Elin Pendleton. I don't get any kick back from sales. I just think she has good information, at a reasonable price. The Pill Boxes? Guess you will have to find out for yourself! The SantaFe Spring Arts Festival was an adventure. Weather this time of year in Florida is always unpredictable and proved that fact again this weekend. Saturday was blustery and overcast. Even so, people turned out...to buy art! Those who attended were there for a purpose, carefully looking over the art, asking questions and walking out of my booth with a new painting. I also received a Purchase Award....Wow! The forecast for Saturday night called for high winds and lots of rain. My husband Harry, an engineer, has an ingenious way to secure my tent from the inside that includes guy-wires and nails. We removed all the paintings and stored them in the van for the night. So, all was safe and I could sleep soundly without worry. We arrived at the show Sunday morning to learn that 3 tents had been ruined by wind and rain. These were the "Show-Off" tents which have a reputation for not being very sturdy under adverse conditions. They have a tendency to accumulate water in the roof and then cave in. My tent was in perfect condition, so back came the paintings. Sunday proved to be beautiful with lots of sun and a light breeze. The folks out that day were there to enjoy the great weather. Families came to stroll, eat festival food and look at art. Not much was sold, but that was ok because of the big sales on Saturday. I , for one, went home very happy. Out door festivals are not for all artists. It is hard work and you never know what the weather will bring. But for me it is very rewarding...not only in sales but also in the interaction with the public. I like selling my work, one on one, getting to know the person who has selected a painting they love. I have developed friendships over the years with collectors and potential collectors. Always remember, everyone is a potential collector. And everyone is a potential friend! I have received questions about "Acra Red". It is a transparent color that goes dull quickly when white is added. Look for Quinacridone Red when purchasing. By the way, I paint exclusively in oil so all my comments will be about oil paint unless I specifically state otherwise. I am happy to have been juried into the Sante Fe Spring Arts Festival in downtown Gainesville this coming weekend, once again. Drop by to see my current work which includes paintings I created in plein air events around the state. You might get a glimpse of Florida you have not seen before. This is the first painting (above) I created at the Dudley Farm Plein Air Event last week. You saw a picture of me painting it in the March 11 post. I was very pleased with the painting and was also pleased when it went home with a collector the first day. 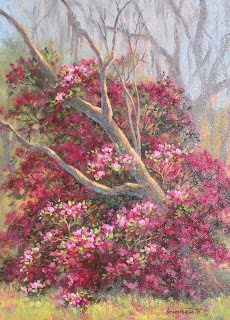 The azaleas were so beautiful I was drawn to them. So, when the first painting sold so fast I, of course, had to paint another one. This is from a different angle at a different time of day than the first. And then I had to go one step smaller. 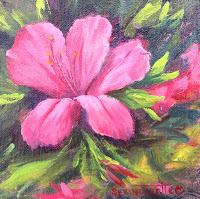 The azalea to the left is painted on a 5"x5", canvas wrapped format. I hold it in my hand while I paint all around the edges, which is quite a challenge and very entertaining to those watching. You can see how the flowers and leaves wrap around the sides. It is really fun to paint this way but very messy. Combine a touch of Cadmium yellow deep and Cadmium red light, add lots of turpentine to make a wash and brush this over your canvas. When you paint the flowers with Acra Red they really "pop". Let me know how this works for you. We had a glorious time painting at Dudley Farm in Newberry. 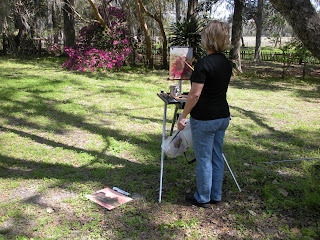 The weather was perfect, unlike the first few days at the Wekiva Springs Plein Air Event. 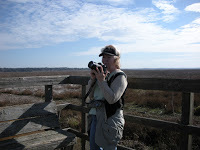 My picture above was taken by Linda, a plein air enthusiast. Thanks Linda for allowing me to use the photo here. The Farm is packed with "paintings", which is painter speak for the fact that everywhere you look there is something interesting to render in paint. Something for everyone makes a perfect paint out. In this case there are old buildings, farm animals (chickens, turkeys, mules, and cows), farm equipment from the 1800's, people dressed in period costumes, vast fields and winding dirt roads. Lots of people turned out each day to watch the artists, buy art and sign the petition encouraging the state to keep the Farm open. Saturday was especially exciting as hundreds of park volunteers attended a big THANK YOU PARTY at the Farm. 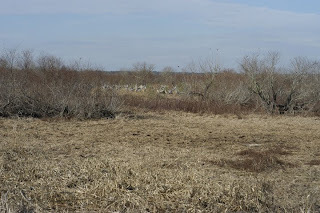 Dudley Farm is on a list of 19 state parks which may be closed in the summer of 2009 due to cutbacks in state funding. I personally hope you will support the drive to keep this Historic State Park open. Go to http://www.floridaseden.org/ to get information about how you can help. There were lots of requests to extend the paint out exhibit for those who could not attend. So, Eleanor Blair generously offered her studio for an Encore! This is a one day exhibit. Don't miss the chance to see (and buy) paintings created by some of the best plein air painters in the state. And yes, 40% of your purchase is tax deductible. You can't have a paint out without event coordinators. A huge Thank you goes to Jacquelyne Collett, Peg Richardson, Annie Paise, Stewart Thomas and Florida's Eden for putting on such a wonderful plein air event. Thanks, you all, you are the best! I have been asked to post an update of bids on the miniature oil painting. So, each Wednesday I will let you know what the highest bid is as of that day up to the deadline day. The highest bid amount will be posted under the painting image. Remember, this is a fun way to add a little painting to your own collection or pick up a couple to give as gifts. The Dudley Farm Plein Air Event officially begins tomorrow, Thursday, March 12, but I took a ride up there yesterday to take a look around and paint a couple of layins. The farm is really neat!! ("neat" is really showing my age, no one uses that word anymore, at least according to my grandchildren). Turn of the century buildings from the old farm house to the wash house, turkeys strutting their stuff, chickens in the yard and vegetables in the garden just popping their heads out of the soil---everywhere you look is a painting waiting to happen. Give yourself a treat and visit the farm this weekend. The azaleas (obviously) and dogwood trees are in bloom, the redbud trees are budding and the oaks are bright green with new leaves. All the volunteers at the farm will be in period dress "doing chores" and 20 plus artists will be working to capture the scenes. You can buy paintings right off the easel, in the wet room or at the Reception Sunday afternoon. A portion of the sales go to Florida's Eden to educate and support the natural beauty of Florida. As the saying goes ... "March comes in like a lion". Sunday, March 1 found me on the road to Wekiva Springs State Park in Apopka for a week long paint out. I arrived about noon and was painting by 12:30. As the afternoon wore on more and more artists pulled in and set up to work. That evening Bill and Mary Sue Weinaug, new owners of the Wekiva Marina, hosted a wonderful dinner for us. This was billed as a fried catfish dinner. So we assumed it would be the traditional, newspaper on the tables, plastic utensils and paper cups. Not so! A huge party tent was set up, tables adorned with beautiful flowers, music was playing and the catered dinner was terrific!!! This paint out has become a highlight of the year for all the artists. Yes, it is hard work...painting from sun up to after dark. But, after the work is done each evening, we gather to talk shop and catch up on family news. I had to leave Thursday morning (7 AM) for Miami. I arrived at the Riviera Country Club in Coral Gables about 1PM to hang my work. There was just enough time to go back to my counsin's house to shower and change before returning at 5:30 for the artists dinner featuring Oysters Rockefeller, NY Strip Loin, Pan Seared Scottish Salmon, Roasted Dijon Herb Coated Loin of Pork, all kinds of desserts and beverages. At 7 PM the doors to the gallery where the art was displayed were opened. All artists were in their place to great the guests and talk about their art. This is always a wonderful evening with everyone dressed in their finest, enjoying fine food and drink...and buying art! I slept in Friday morning, but was on the road again about 1 PM headed for Ft. Pierce. I stayed that night with friends on their ranch, which is like being in a wildlife park. As we sat in rocking chairs on the front porch the deer began to appear out of the palmettos. Soon there was a herd of about 15 grazing in front of us. Then sandhill cranes flew in and of course, wild turkeys. Friday morning found me at the Backus Museum in Ft. Pierce for the Backus Festival. I set up my easel and began to paint about 10 AM. As a Backus student, I had been invited to paint in the museum and talk to people about Bean -- which are two of my favorite things to do. The day went quickly and it was closing time before I knew it. I arrived home Sunday afternoon with both my husband and puppy happy to see me. It had been a long, hard week, but I would do it again. And, probably will next year. Friends of Wekiva River is once again hosting a week long plein air event in conjunction with the Wekiva Riverfest. This is an invitational event that I have been fortunate to participate in for the past 2 years and again this year. Wekiwa Springs State Park in Apopka is a fabulous place to paint. The diversity of landscape in the park offers artists everything from lakes with wading birds and natural spring headwater to sandy paths and spanish moss drapped oaks. Artists are housed in the Park's Youth Group Camping Complex. Being on site makes painting from sun up to sundown possible. And you will often see a painter working by moonlight. Artists begin arriving Sunday, March 1 eager to get down to business. Many will have a painting in the Wet Room on Wekiva Island by evening. During the week as paintings are finished, but often still very wet, they are hung for the public to see.....and purchase. If you havn't attended a plein air event this is one of the best. Watch artists create paintings right before you......and yes, you can buy that painting wet, right off the easle. A portion of the sales go to the upkeep and restoration of the Wekiwa River. That makes this a win-win situation for everyone! Go to http://wekivapaintout.com for additional information. 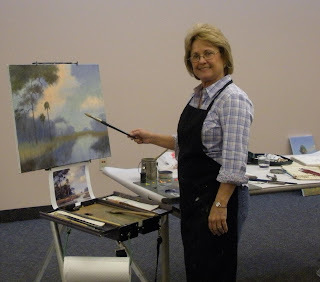 My painting demonstration at the Appleton Museum of Art in Ocala, Florida, was great fun for me. We had a delightful group who was full of enthusiasm and questions. The format of my demonstrations is always relaxed and informal. People may move chairs around, making sure no one else's view is blocked, stand, ask questions and make comments. This always generates a lively discussion and more interaction. Backus was the focal point of the day, not only his painting techniques but the kind and gentle man himself. I was able to clear up two questions everyone asks, how he got the name Bean and his relationship with the group of painters now called the Highwaymen. Backus is a favorite topic of mine so the 3 hours went by fast...you just can't beat painting and talking about what is near and dear to your heart. Koreen, Education Director at the Appleton, was a gracious host. The facility is wonderful with great lighting for painting in the classroom and beverages were provided. If you are interested in having me speak about Backus or give a demonstration, please get in touch. I am always ready and willing to enlighten people about my teacher, friend and mentor, A.E. "Bean" Backus. The Reception for the Director's Circle to preview the A.E. Backus Exhibition went very well. I worked all week on my presentation and managed to pare Bean's life down to about half an hour. I said everything I wanted to say about his life without getting into to much detail but still creating a picture of the outstanding man that he was. I have been asked to share a copy of my talk with the Docents at the Museum so they will be better informed about Bean's life. So I plan to make that available to them. There is such interest in these personal stories about his studio I may add a blog site devoted just to that. I will let you know when I get that up and running. Or add a comment here with your request to be notified when I post it. Bean influenced a great number of artists as well as non artists, challenging all he met to follow their own personal dreams and goals. He taught us to share what we have, whether that might be information or money; to accept people for who they are not what they have become; and not to judge anyone by the color of their skin but the works they do. "I would rather be remembered as a humanitarian than the greatest artist in the world". Linda Blondheim is a wonderful artist whose blog I read regularly (address listed below). 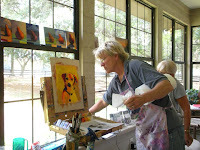 Last week she issued an open invitation for all to visit her Studio Open House, Saturday, Feb. 7. 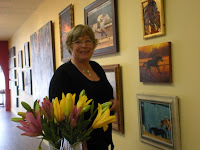 I am always interested in seeing other artists studios so I scooped up my friend and great equine artist Sharon Crute (blog address also listed below) and off we went. Linda had given me directions and I had taken my GPS along just in case. We didn't do too badly considering I got off I-75 at the wrong exit. Oh well, the GPS took us right there in spite of my goof. The studio is in North East Gainesville in a pastoral setting..with cows and everything! You can hear the wind in the trees instead of cars!! Perfect place for an artist's studio. Now I understand where Linda got her inspiration for her series of yard paintings...she just steps right out her front door. The art work was so wonderful I had to buy a little painting for my personal collection. The chili, with ALL the trimmings was hot and tasty and the brownies to die for. Sharon and I hated to leave the studio filled with guests all talking art and buying art! But, we had been there a couple of hours and needed to make room for new arrivals. To ease our pain we stopped by the Krispy Kreme Donut Shop in Gainesville on the way home! It was a YUMMIE day. Doom and Gloom! Newspapers, television, radio ---all are telling us what is wrong with America. It is enough to weaken the knees of the strongest of us. I am not a "polyanna" but an optimist. America is not on it's last leg, we are just limping a bit. Money is still out there. Maybe not as much as before, but still in the market place. Things are getting better--we have always rebounded. To quote Jack White as written in his column in Art Calendar Magazine, Jan. 2009, "...artists have a positive attitude and the ability to weather adversity. They don't let a small glitch slow them down. Being creative for a living has insultated them from listening to the outstide static. They know how to focus on controlling what they can do..." He goes on to say "...It's all about attitude. When an artist goes to a show down in the dumps, you can bet your best boots that artist bombs. But if you go expecting to do well, you'll do great. It is that simple." We create our art because we love the process. We also appreciate getting paid for our efforts. So, I for one, intend to keep on keeping on. I plan to work harder on my marketing, getting in touch with past collectors and building relationships with new collectors. There is much to be done in and out of the studio. White wrote "...many of you will give up making art. Some of you won't be able to adjust your attitude to take on the challenges of the coming year. But a few of you will thrive. Those who can will be way ahead in the race when the economy recovers. This is America and the economy will recover. America may get her nose bloodied, but she stays in the fight. I implore you to join me and do the same". MINI PAINTING AUCTION: Thanks to everyone who sent in bids. The first mini painting has been sold. Posting a mini painting every Wednesday is a bit too much. So, a new one will be posted the First Wednesday of each month. This little painting is oil on canvas mounted on gator board. I got such a big response starting the bids at 25 cents last time lets start the bidding at 99 cents. Remember this includes shipping. Email your bid to me (schindehette@embarqmail.com) and put auction in the subject line. This is me and Bean on his 80th birthday in 1986. He was still using his record player. The package he is holding is a Count Basie record I gave him for the occasion. He was an avid jazz fan. Some days he would really crank up the sound. We would paint and kind-of dance around the studio, swaying to the music. But sometimes, he would actually do an easy jitter bug (as he called it) with me. As you see, I am still waxing poetic and very nostalgic about those days. Now, back to the present. Dr. Lofgren, Appleton Museum of Art Director, visited my home and studio yesterday. A charming young man named David, sorry I did not get his last name, came along too. Dr. Lofgren said he was the talker and David was the guy who really worked. True enough, Dr. Lofgren talked and David took notes. Dr. Lofgren has some wonderful ideas for the Appleton. His enthusiasm is infectious and his love for the arts and his job is obvious. I will keep you informed as these ideas materialize. Yea!! My web site http://www.floridalandscapes.com/ is up and running again. After studying the How To Build It book for my web site program I gave up, called for techie help and VOILA she fixed it in a couple of minutes from her end of the line. So, now I have decided to add building a new site to my long list of things to do. The current site is a bit outdated in its format. I do change the images and schedule regularly, just need to update the layout. Got any suggestion for me? What would you like included...or left out? Add your suggestion here by way of a comment. I also got my NewsLetter going. It will be sent once a month with updates on my show schedule, images of new paintings as they are created, new prints as they are released and anything else extraordinary that may happen. Visit here to get weekly updates if you don't want to wait for the NewsLetter. As I previously mentioned I have been concentrating on and putting a lot of time into the business of art. My files are cleaned out and on their way to being organized, email addresses are uploaded into my new contact program and my web site is on its way to being fixed...but, it is still not on line. I was merrily humming along when I got whammed! Our local, and very fine, Appleton Museum of Art is hosting a teriffic exhibit showcasing the art of A.E. "Bean" Backus. He was my friend, teacher and mentor! He is the very reason I paint! And an outstanding collection of his work is coming to my home town!!!!!! WOW!! I always participate in any event or exhibit that promotes Beans work. In my opinion, he is under appreciated...his art as well as his major contribution to raising the level of respect for Florida artists. He is considered the "Father of Florida Landscape Painting", coming into prominence as a national artist in the late 1960s when his work was hung in President Lyndon B. Johnson's library in Texas and in the Senate offices in Washington, D.C. and was inducted into the Florida Artists Hall of Fame in 1993. So, I contacted the Appleton Museum and spoke with Dr. John Lofgren, the Director. He is a warm and receptive gentleman filled with enthusiasm. Speaking with him was a breath of fresh air...not at all the stuffy type we offten see in lofty positions. I am delighted to report that he invited me to speak at the Gala Directors' Circle Reception that will preview the exhibit February 12. I plan to enlighten the folks on The Artist Bean's direct approach to painting from an artists view and to share personal stories of The Humanitarian Bean whos door was always open to everyone. Then on Saturday, February 21 I will conduct a demonstration at the Appleton on the way Bean went about creating his paintings, from pencil sketch, pallete, brushes to painting. One of the things Bean stressed was that there are no secrets...he generously shared his knowledge. He knew each person brought their own gifts to their painting and that no one ever produced a painting just like their teacher. He was one of those very rare people who was not threatened by anothers success. So, I have put my business me, aside for now. I am immersed in memories. Reliving those very first days at Bean's studio in Ft. Pierce, just visiting at first and then moving on to painting alongside that kind and gentle man. I have been asked to speak for about 45 minutes to one hour...it will be very hard to condense a lifetime into those few minutes. I was with Bean the day he died, June 6, 1990 at the age of 84.....and yes, we were painting that day. As a working professional artist I am very aware of the need to also be a business woman. Alas, how nice it would be to just paint all the time...a lament heard from all artists. Over the years I have developed a mail list of collectors who have purchased as well as those who have expressed an interest in my work. I have sent post cards via snail mail (US Post Office) with an image of a new painting and information about upcoming shows to these folks at various times of the year. It is wonderful to have someone arrive at a show with my card in their hand, saying how glad they were to receive it. But, times are changing. I must now add "email/newsletter blasts" to my marketing tasks. So, to this end I signed up for an online service that allows me to send these messages with a click of the mouse. The send with a click sure does sound easy. It is all the behind the scenes stuff that gets so frustrating for me. Getting through the digital maze, uploading files or in my case typing in hundreds of email addresses, uploading images, figuring out how to use the template, etc. etc.etc.!!! And just when I think I have it all down...everything just disappears. I have spent days on this project. My friend, Sharon Crute, has given me some pointers, but when alone at my computer nothing makes sense. I perservered and have gotten all my email address loaded into the program. I felt pretty good about finally completing that part of the process. So, next I tried to add the little "subscribe to my newsletter" box to my web site. The directions sound simple enough. Wrong. I have managed to completely destroy my web site. It can no longer be found on the internet. A prompt comes up saying the site is under construction. Actually it is under destruction. Oh well, I guess I will spend at least a day on the telephone with the techies to try to figure this all out. If anyone would like to subscribe to my news letter just email me (schindehette@embarqmail.com) and put subscribe in the subject line. When I get it all straightened out you will receive notices of upcoming shows and new paintings about once a month. I promise not to share your info with anyone and you can opt out at any time. In the mean time, I will continue to send out my post cards.....at least I know how to do that! 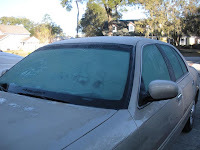 Florida, "land of sunshine", has been having freezing temperatures this week. Three days in a row I got up to find ice on my car and all the fern in my yard has turned black! I know for some of you this isn't such a big deal, but we are used to lows in the 60s NOT freezing...so we don't have all the cold weather clothes. 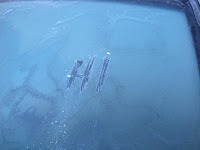 The ice was so thick I wrote HI on my windshield! I have discovered these wonderful little-teeny-tiny mini canvases. This one measures just 4"x2". Not much space to paint an intricate, detailed scene, but certainly room for a Cabbage Palm (also known as a Sabal Palm) or a bird. And yes, these are original oil paintings! Check back here each Wednesday to see what new image I have been able to squeeze into this small format. If you are intrigued, have no more room to hang large paintings on your walls or just want to join in the fun, email me with your bid (schindehette@embarqmail.com) and put OFFER in the subject line so I know to open it immediately. Bids will be posted throughout the week so you can keep up with the action. Let's start the bidding at...lets say....25 Cents! And I will throw in sales tax and shipping. While in Ft. Pierce for the show opening at Picture Perfect Gallery I stayed in a condo on North Hutchinson Island owned by a friend. I know, I know, tough work but somebody has to do it! As I sat on the balcony overlooking the ocean and sipping my coffee one morning I noticed something on the beach I could not identify. So, of course, I had to investigate. As I approached the thing a couple of wildlife officers arrived right behind me. 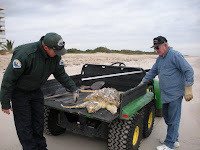 We all were saddened to find a dead sea turtle. Years ago when I lived in Ft. Pierce my family often walked the beaches late at night to watch the turtles materialize out of the black water, drag themselves up on the beach, dig a huge hole and lay hundreds of eggs. 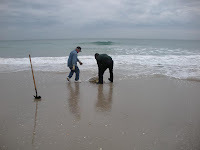 At that time it was legal to be on the beach and watch turtles lay eggs, unescorted by an official. My young sons were always excited about the adventure and as a result, I believe, developed a healthy respect for nature and awe for all living creatures. There were no visible marks on the turtle to indicate what may have killed it. The wildlife officer said they would perform a necropsy to get more information. As they drove away I could not help but feel a sense of loss. 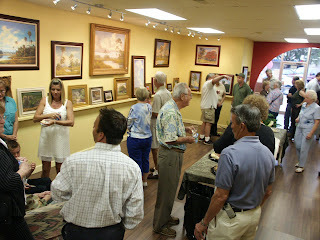 I have just returned from Ft. Pierce, Florida where I am the featured artist at Picture Perfect Gallery and Frame Shop. The artist's reception was Wednesday evening during the City Art Gallery Walk. We had a wonderful turn out, giving me the opportunity to see long time collectors and friends and even meet a number of new art lovers. Loretta Northrup, owner of Picture Perfect, had not been in business very long when I began my professional career over 20 years ago. She has represented my work in the Ft. Pierce area ever since and hosts a show for me once a year. Sarah, on the left, and Jessica, on the right above, are the great gals that do a lot of the work putting the show on. A big thanks to both of them. Doris Tillman, Director of Main Street Fort Pierce, Inc. is also a long time friend. She makes sure all the fun stuff that goes on downtown like the Gallery Walk comes off without a hitch. With all that she is responsible for during these events I was delighted she took time out to drop by the reception. A grande time was had by all...and we even sold some paintings...always a good thing! I am fortunate to live in one of the best parts of the state of Florida. A one hour drive takes me to beaches, natural springs or vast prairies. 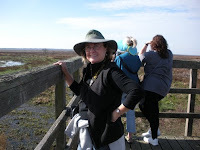 This past week I went with two friends, Moe Hahn above at the top and Sharon Crute underneath ...both wonderful equine artists, to Paynes Prairie Preserve State Park. 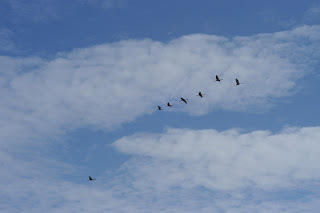 Sandhill Cranes migrate through this area, but almost 5,000 of them have decided to stay for a while. A great number of birds can be seen on the La Chua Trail which begins in the park entrance off SE 15 Street in Gainesville. There is an easy 1.5 mile walking trail out to the raised viewing platform (remember it is also 1.5 miles back!) But you don't need to go that far. The day we went most of the birds lined the trail. They kept their distance and continued feeding while throngs of people watched and photographed. Even though I am a Florida native I have never seen a flock of Sandhills in this great a number. It was thrilling to say the least to see nature in all her glory. The squawking was continuous as the birds called to one another...a sound like no other. 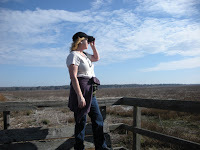 Rangers told us there are a couple of Whooping Cranes in the flock but we did not see them. If you go out watch for alligators. They are not a direct threat, but it never hurts to be cautious with these guys, which were some of the biggest wild gators I have ever seen. We even saw a mom with little babies! Believe it or not, baby gators are cute. And....Oh yes....here I am. All decked out in my safari hat and everything! I have begun a list of my goals as promised yesterday. At the top of my list...the number one goal...is to get better organized. I am not too bad at this. My main problem is I get toooooo organized, making a file for each and every thing. This leads to overflfowing file drawers. I get so carried away that I often find that I have made several files for the same thing! So, I have started culling, consolidating and throwing away. Yes, I actually have a trash can full of old papers (some dating back to 2001). Now, don't get alarmed. I am also recycling. All unwrinkled paper printed on one side goes into the scratch paper bin. This is great when I want to print an email to save in my afore mentioned files (oops, here we go again). Cleaning out the files should take a couple of days. Then I will divide everything into categories and relabel. I feel pounds lighter already!